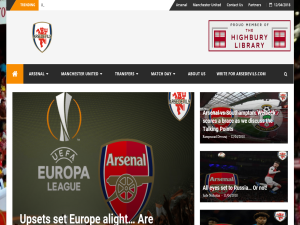 Latest Arsenal and Manchester United News, Transfer Updates, Match Day previews and reviews of EPL and Champions League. Blog by passionate supporters. This what your ARSEDEVILS Blog Ad will look like to visitors! Of course you will want to use keywords and ad targeting to get the most out of your ad campaign! So purchase an ad space today before there all gone! Arsenal have to blunt the appetite of Wolves. Arsenal have a crucial match away against Wolves at Molineux tonight. After their failure to take advantage of their rivals misfortune by being beaten against Crystal Palace 3-2, this outcome could determine whether the gunners claim 4th position in the league at the end of the season. There’s no room for error as the season winds down, the games get fewer and the points become more important. Unai Emery’s attempt to rotate a shallow squad ended in failure against Palace and it’s clear that Arsenal need to buy to replenish, not only the first team but also the available choices from the bench. Yes, injuries have been a factor but there is a lack of genuine quality and it may take at least two transfer windows to resolve.The other factor in the Palace defeat was the poor defending of Shkodran Mustafi, who had a hand in all three goals and as a result of Sokratis being available after a two match suspension, he’ll surely find himself on the bench. I don’t think Emery can afford to jiggle his side or formation too much but the absence of Aaron Ramsey at this stage of the season is ironically important. Having that type of available option would have helped the cause in terms of physicality and attacking ability. Wolves will be looking to heap more misery on the Gunners and gather the points for the sake of it. There are no targets left, premier league survival is assured, they are out of the FA cup and are currently 19 points off a top four finish. It’s now about pride and performance with Wolves manager Nuno Espírito Santo demanding they finish on a high in preparation for next season. Wolves won’t be there for the taking and they have class and quality to make a dysfunctional Arsenal pay if they lose concentration. Raul Jiménez has 16 goals and 7 assists.Matt Doherty and Diogo Jota have 15 goals between them and a combined 13 assists for Wolves. Then there’s the sophistication and creativity of Ruben Neves and the defensive guile of Conor Coady, who it has been said was an Arsenal target. The last six games in the head to head have included six defeats and two draws going back to April 2010. Wolves are unbeaten in their most recent nine home matches in all competitions, winning seven of them, so Arsenal will have to make and take their chances, which puts pressure on Lacazette and Aubameyang. DEFENSE: Maitland-Niles, Sokratis, Koscielny, Monreal. The post CONFIRMED LINEUPS VS WOLVES : Gunners Look To Get Back On Winning Terms As They Face Wolves In A Crucial Away Game appeared first on Arsedevils. Unai Emery has essentially the same squad as Arsene Wenger but they are performing much better if you exclude their away form, which has been a problem for a while. You have to give credit where credit is due, with a change of manager, tactical tweaks and squad rotation, Emery has delivered far more at this stage than anyone could have imagined. Though a first-place finish is an impossibility at this point, sites like SBD suggest that the Gunners are confidently on track for a Top 4 finish, and a return to the Champions League after a two-year absence. Emery, in his first season in the premier league, has worked wonders with a disjointed side. At the beginning of the season many fans were convinced that a 5th or 6th place finish in the premier league would be a credible if not desirable outcome. He has exceed those expectations by some distance, even with the various challenges he has faced including a host of injuries at crucial times in the campaign. Arsenal are no longer following the established blueprint of a rigid 11 players and now set up for each game with the opposition in mind. If players are not performing to the required level or are not best suited the opponents, then they are benched or excluded to get the required results. It hasn’t always worked but more often than not it has. Emery has squeezed every ounce out of his side with ruthless efficiency, using substitutions to effect and changing his formations mid match to change a game. No disrespect to Arsene Wenger but Emery has managed to make a silk purse from a sows ear and regularly pulls rabbits out of a bottomless hat. He has increased the overall intensity and the collective desire and spirit of a side known for capitulating at the first signs of trouble. There have been blips which have seen Arsenal slip back into bad habits but slowly, the Spaniard is moulding a team, that with a few key additions could fight for the title. Perhaps not next season because it will only be phase two of the rebuilding programme and it will almost be like starting again. It’s also remarkable how he has managed to inspire players to perform at a higher and more consistent level than before. Lacazette is a far better player but that can also be said of Kolasinac, Ramsey, Maitland-Niles , Iwobi and Xhaka. There are still issues, some due to injury and some because the individuals he has simply aren’t good enough or are incapable of change. Ozil is the enigma he always was, Mustafi is consistently inconsistent and Monreal has lost his pace. Yet, fans should be optimistic about a future under Emery. With a crop of talented players knocking on the door and a few new faces, Arsenal could actually become a force again. It’s likely that next season will see a dramatic change in personnel as Emery finally moulds his own side to meet his demands. It used to be fairly easy to predict the Arsenal side for any match but this season, it’s been almost impossible. Emery varies his formation and as a result, shuffles his players accordingly. I dare say it was a shock to personnel used to making the team sheet regularly regardless of their performances but it now seems expected and accepted. He has even managed to do without Bellerin, Holding and Suarez who apparently has injured himself without playing much. The summer will be interesting, not least to see if Kroenke backs his manager with cash and brings in his preferred targets. Even if the season were to tail off now, Emery has proved his worth and fans know that their club is in capable hands. The post Arsenal’s Unai Emery Has Actually Overachieved With Arsenal This Season And Here’s Why appeared first on Arsedevils. Arsenal look at Kerem Demirbay to replace Aaron Ramsey but who is and is it a good fit. According to the Daily Mirror, Arsenal have contacted Hoffenheim regarding the transfer of German midfielder as a replacement for Aaron Ramsey. Arsenal are believed to be targeting Hoffenheim midfielder Kerem Demirbay as a replacement for Aaron Ramsey. Let’s start by saying that the players are not similar in anyway apart from their natural desire to go forward and assist the attack. Demirbay (25) is not a well known name but he is certainly an exciting talent and will be available for around £30m. The Hoffenheim connection could possibly involve another loan deal for Arsenal youngster Reiss Nelson so not only is Demirbay relatively cheap but there may be something of a reciprocal deal to be done. Demirbay’s style is reminiscent of Ramsey’s and can find his teammates by some pinpoint passing. Demirbay is capable of confusing defenders and goalkeepers with his very precise left boot, and is renowned for his range of passing. Looking at Demirbay from the available footage, he is a tenacious baller with superb close control but he can also provide long precision passes into the danger areas, the sort of pass that David Beckham was famous for in his peak. #Hoffenheim's Kerem Demirbay has an exit clause in the region of €20m to €30m. The two Turkish clubs #Besiktas and #Galatasaray are interested but don't have the money. #Arsenal have also voiced their interest (Bild). His intensity is such that he will gladly get forward but also track back to put a foot in and retrieve the ball. However it’s his willingness to progress up field and avoid challenges that sets Demirbay apart from others that have been previously touted targets to replace Ramsey. Demirbay is not scared to take on multiple opponents and his close control allows him to twist and turn pass players to provide a quality pass or an assist. He is not a prolific scorer but he can hit a ball with a thunderous right foot from outside the box, perhaps he should and could score more but his vision exceptional. Demirbay is no Ramsey but can be an upgrade and he certainly fits the bill of the type of player Unai Emery is looking for. Ramsey, who suffered a hamstring injury against Napoli mid week is leaving the Gunners at the end of the season for Italian champions Juventus. Been wanting to say this for sometime but #Arsenal can replace Aaron Ramsey with Kerem Demirbay of Hoffenheim. Excellent midfielder who not only creates but also works his socks off & contributes defensively. The German’s contract is valid until 2022 but it’s believed that there is a release clause and that he may relish the prospect of a move to the premiership. Kerem Demirbay can be a good addition and can prove to be a like-to-like replacement for the departing Welshman. The post Arsenal Chase Hoffenheim Midfielder As They Look To Replace Ramsey appeared first on Arsedevils. Manchester United and Ed Woodward are trying to find a way to rid themselves of Alexis Sanchez, having grown tired of waiting for a return on their investment. The Chilean is contracted until 2022 and continues to eat away at the northern club’s finances with his astronomical wages of £32.2m per year, £318,205 per week, £45,457 per day £1,894 per hour, £31.56 per minute, or 52p every second. He also gets an extra £75,000 for every game he plays and an annual £1.1m signing-on fee. This is surely one of the worst deals in football history and virtually rules out the chance of anyone coming in for the misfiring forward. Alexis Sanchez has scored just six goals during his spell at United and is just one of the number of ridiculous follies under Jose Mourinho, that have cost United £391.5m and includes £93.3m for Paul Pogba an £75m for Lukaku. Na Manchester United player wages be this. Mourinho, the architect of all this misery walked away with an undeserved gangrenous payment of between £17m – £22m and has probably secured a kiss and tell book deal that shows him in a favourable light. No doubt, he will be played by George Clooney in the film, with Idris Elba as Paul Pogba and Julio Jung as Alexis Sanchez, which is only hilarious if you look him up. It’s only now, with United stable under Ole Gunner Solskjaer, that chief executive Ed Woodward can attempt to save his job by cutting the gristle off the steak. Woodward, rather bizarrely, is a former accountant and investment banker, titles that don’t really sit well against this sorry episode in the club’s illustrious history. Ed Woodward is now on the clock with orders to sort this unholy mess out and to get Manchester United back to winning ways or else. As United faltered in December, it was clear that either the manager or chief executive would have to go. Woodward narrowly survived, but he is guilty of allowing Mourinho too much artistic license and money in the hope of recapturing the glory days. It’s the old adage, if in doubt, throw money at it ! It didn’t work. The initial success withered away and a toxic atmosphere enveloped the club, suddenly the gravy train had run out of steam. It’s slightly bemusing to think that United have allowed themselves to get in this position. Any other club may have gone bankrupt, but they are not Manchester United, who will always generate enough cash to cover up their mistakes and make good on their loses. Ole and Ed, which sounds like some sort of children’s television show, have lost patience behind the scenes and are apparently ready to sanction a mass cull to rid themselves of the plodders and the leaches. In theory, there could be a dozen departures across the board including the first team and fringe players, which will go some way to freeing up funds for new players. The new dawn under Ole needs to deliver for the sake of the club, himself and Ed Woodward, the chief executive, who is nearer the edge of the cliff than anyone else in this scenario. The post Ed Woodward’s Time at United Is Up | This is Why our Chief Executive Needs to Correct his Mistakes Before Time is Up appeared first on Arsedevils. Misery piles on Ole Gunnar Solskjaer as Manchester United slip down to a new low after being beaten soundly by Barcelona 3-0 at Camp Nou on Wednesday. With this defeat, the little hope of earning a silverware this season was shattered. After a fairytale entry into the quarterfinals, the Red Devils were expected to give Barcelona a hard time. The first leg favoured neither of the sides as Barcelona edged past United 1-0 at the Old Trafford on the back of a Luke Shaw own goal. Trailing by such minimal margin, everyone expected United to put on a spirited show after drubbing opponents like Juventus and PSG in their second meetings. But the magician in Messi had other plans. Lionel Messi against United, was the man with the golden touch. Although, he was helped by some sloppiness by De Gea, all-in-all it seemed like Messi’s footwork will get the better of most defenses on the day. Such was the impact of the Magician on the crucial match. United started on a positive note with crisp passing and Pogba-Rashford combining well to keep the Barcelona defense on their toes. But, once Messi got one to sail past De gea 15 minutes into the game, it was all downhill for the visitors. 4 minutes after gaining the lead, Messi got the ball to sneak under De gea’s hands to double their lead and thereby, destroying United’s hopes of a place in the last four brutally. As the season reaches its business end, things are not going well for United. Many players would be under the axe as the situation demands a desperate revival of fortunes. A Champions League is the only positive that can come from this season and fans would hope that this doesn’t elude them. The post “The attitude was right”- Solskjaer Scrapes the Barrel to Find the Positives Out of the Champions League Quarterfinal Clash Against Barcelona appeared first on Arsedevils. Since arriving at Arsenal in 2018, Unai Emery has had a positive impact at the club. His tactical knowledge and footballing nous have been a revelation and his ability to motivate stale players that were hardly ticking over, is without question. However, there is an area where he fails miserably in my opinion, the captaincy of the club. Obviously, Laurent Koscielny was still recovering from a long term injury and the Spaniard would be deprived of his services from the beginning of the season. He had to name a player in the Frenchman’s absence, possibly two, the other as a vice Captain. Instead he named five. Koscielny, Petr Cech, Aaron Ramsey, Mesut Ozil and Granit Xhaka. It was a farcical move that removed all hope of establishing meaningful leadership and his tendency to rotate eradicated any chance of stability. Ramsey, I understood because of his determination and character but the decision to appoint Xhaka and Ozil was baffling. Neither showed any signs of leadership or the ability to control events or take charge on the pitch. As for Cech, I’ve never liked goalkeepers as captains because they rarely influence a game. Equally, I dislike strikers being captain because of the increased pressure on their role. No, I’m more inclined to look at a midfielder or centre back for the role and with things the way they are in Arsenal’s flimsy defence, I’m even more inclined to think that Arsenal’s next long term Captain should be from the backline. Two of the greatest Captains in the club’s history, Frank McLintock and Tony Adams came from that position. Yes, Vieira was good and Henry on occasion but neither were as consistent or as driven as the two I’ve already mentioned. We are talking about season after season, influencing and motivating others, demanding a response, driving the team on to victory. McLintock in 1971 and Adams in 1989 delivered handsomely for the club and continued to do so for the rest of their careers in an Arsenal shirt. Mc Klintock once told Charlie George before a match that a certain manager didn’t think much of him. George subsequently performed brilliantly and his contribution helped win the game. George left the field to confront the bemused manager, realising he’d been duped. Adams cornered a young Lee Dixon before the North London Derby and told him in no uncertain terms that he needed to perform. I’m not saying that these are the best examples of a captaincy but both got performances out of those around them one way or another. So, when this season is over and the rebuild begins, instead of the having five captains unfit for purpose, let’s try to look at who could take the armband permanently. Let’s just acknowledge that Koscielny will probably complete one more season at the Emirates while Emery constructs a side that suits his own image. Unless the Spaniard buys a ready made Captain and midfield general in the summer, then he will have to chose from his existing personnel. The candidates I’m about to name are not the finished article, they are young and will have to grow into the role. The appointment of any of the three are not without problems, but what they show is passion in abundance and the ability to influence a game by playing well. So, who are these candidates ? Matteo Guendouzi is every inch a candidate for the role. I like his fiery Gallic flair and combustible temper. For someone so young, he is not adverse at showing his displeasure to senior players or standing his ground whilst he argues his point. However, he needs to control his game more, learn from his mistakes and stop remonstrating with officials or going to ground like a wounded pigeon. He is certainly one for the future if he continues to excel as he has done so far. Lucas Torreira has all the attributes of a Captain, possibly as soon as 2020/21 season. I’m not sure about the language barrier but his performances say more than words ever could. Determined, forceful, driven, a leader in the making. Constantly trying to seize the game and squeeze out an advantage for his team. Who knows, by the time Koscielny leaves, he may be ready. Rob Holding showed against the Brutish Diego Costa in 2017’s FA cup final, that he is up for a battle and able to ruffle feathers. His absence has caused a flap in defence, similar to when Koscielny went missing long term. He has the potential, he has the attitude and within a year, possibly two, he could be the perfect fit. He will have to become less respectful and boss the backline, Arsenal have missed someone that barks, points and organised. Could Holding be that man ? Who are your candidates as the next Arsenal captain ? Leave a comment. The post Emery Needs Fewer Captain’s And Should Appoint A long Term Successor To Koscielny. appeared first on Arsedevils. If you are the owner of ARSEDEVILS, or someone who enjoys this blog why not upgrade it to a Featured Listing or Permanent Listing?